Big Brothers Big Sisters Twin Cities announced the Live Auction items for its upcoming Big Night Gala on Thursday, April 25. Please call Micaela Olson Macgregor at 651-789-2431 to inquire. Thursday, April 25, 5:30-9 p.m.
Golden Tickets are now on sale! Grab your Golden Ticket TODAY for an opportunity to win ANY Live Auction item of your choice! Winner does not need to be present to win, so anyone can play. Tickets are $100 each and can be purchased by cash or check at the BBBS Office. Contact Rebecca Merrill via email or at 651-789-2423 with questions. Enjoy a one week stay at a fabulous Fountain Hills three bedroom, three-and-a-half bath home located on the 12th green of FireRock Country Club. Home is within 20 minutes of beautiful Saguaro Lake and many of Arizona’s most prestigious golfing venues and wonderful hiking trails. Included is a gift certificate for four to We Ko Pa Golf Club and a gift certificate for four to SunRidge Canyon featuring two 18-hole courses, both ranked in the Top 20 nationally for resort courses to play. Two stars in one unforgettable night! The best safety in the NFL, Minnesota Viking Harrison Smith, and award-winning restaurateur David Fhima are teaming up to provide a once-in-a-lifetime private dining experience. Join Harrison for a splendid five-course, wine-paired chef’s tasting for ten guests at Fhima’s historic Lowry Hill mansion. Enjoy a truly priceless experience with one of the NFL’s best on and off the field! As an added bonus, you’ll get Harrison’s game-worn, signed “Big Brothers Big Sisters” cleats. Donated by Harrison Smith and David Fhima. Date to be mutually agreed upon by winner, Harrison Smith and David Fihma. You and up to seven guests can experience what rising star Chef Ariana Feygin brings to the table. Ariana has been fostering her culinary skills since pre-K and was a finalist on the 6th season of FOX’s MasterChef Junior, where world-renowned chefs such as Gordon Ramsay praised her skills. She has started her own company with a strong philanthropic mission, and has already raised over $250,000 for charitable causes she is passionate about. Ariana has had the opportunity to learn from some of the well-known and Michelin-starred culinary teams in the US and abroad (including Gavin Kaysen’s “Spoon and Stable,” Andrew Zimmern’s “Lucky Cricket,” and 3 Michelin-Starred “The French Laundry”). You will work with Chef Ariana to curate a multi course tasting, with wine pairings by her dad, who is a Napa Valley Wine Academy Certified sommelier. Ariana will showcase a wide array of techniques that she has learned from the TV set to Michelin-starred Kitchens and dazzle your guests with an experience you will never forget. Donated by Ariana and Lenny Feygin. Date to be agreed upon by donor and winner. Discover the beauty, culture and adventures waiting for you on a seven-night dream vacation to Maui. Enjoy full views of the ocean, breathtaking sunsets and gorgeous West Maui Mountains from an expansive three-bedroom, two-bath condo that has all the conveniences of home. Bring the whole family – the suite comfortably sleeps up to eight with two king beds and two queen beds. Enjoy the resort or explore nearby Kaanapali, Kapalua, and downtown Lahaina. Donated by Ken and Brooke Barrett. Winner must pay $399 resort/linen/cleaning fee and $79 damage insurance policy. Dates subject to availability. Peak months (Jan-March) and major holidays not available. Airfare not included. Enjoy a one-of-a-kind Minnesota Timberwolves experience! You and 11 guests will take in the game from the Federated Insurance suite at the Target Center. Enjoy unlimited locally sourced organic food options designed by Chef David Fhima and premium beverages – including craft cocktails, local beer, and stadium classics. Package also includes three parking passes. Winner will choose a 2019-20 game mutually agreed upon by Federated Insurance. Enjoy the ultimate Wild hockey experience with a Wild “press pass”! Your day will start with a pre-game meal at Tom Reid’s Hockey City Pub just blocks from Xcel Energy Center. You’ll then head to Xcel for a complete tour of the press facilities and a pre-game visit with veteran Wild broadcasters Bob Kurtz and Tom Reid. Get ready to shout “Let’s Play Hockey” as they drop the puck. You will be close to the action in your two seats in Row 7. After the game, enjoy a one-night stay plus breakfast at the Saint Paul Hotel. Donated by Ed Christie and Saint Paul Hotel. Date to be agreed upon between donor and winner. Private tasting class with instructor for up to 15 people in the cellar tasting room at the North Loop Wine & Spirits. Learn how to judge quality, read a wine or beer label, describe the taste like a professional, and impress your friends with your newfound knowledge. Donated by North Loop Wine & Spirits. 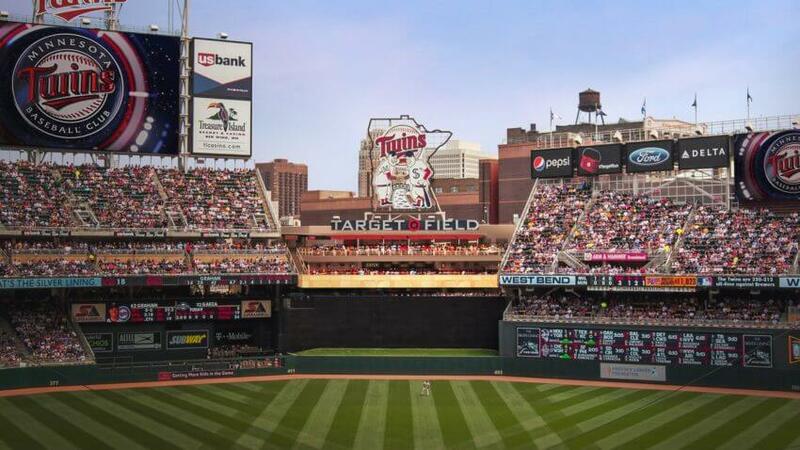 Die-hard and casual Twins fans alike will be amazed by this private tour of Target Field led by Clyde Doepner, the only full-time team curator in Major League Baseball. Clyde “The Guide” will give you a behind-the-scenes peek into private spaces within Target Field, highlight decades of rare Twins memorabilia, and astound you with his encyclopedic knowledge of baseball history. Following the tour, you’ll be treated to a 3M suite experience for 18 guests to watch the Twins play the Detroit Tigers on May 11, 2019. Donated by 3M and Clyde Doepner. Game and tour must take place on May 11, 2019. Go up nort’ in style! Enjoy the North Woods at a luxury lake home on Pig Lake on the Whitefish chain. For five nights, enjoy boating, water skiing, tubing, swimming, building sand castles, and watching gorgeous sunsets over the lake from one of three patios. Bring your family and friends—this four-bedroom, five-bath home sleeps ten comfortably and has an open floor plan, soaring ceilings, and a private master suite. Take the on-site pontoon for a spin around the lake or to visit lakefront bars and restaurants just minutes away. Donated by Kristine and Matt Rauenhorst. Dates to be between August 1, 2019, and June 30, 2020, to be agreed upon by the owner and winner.